There is a road in Basdorf named 'Fuchsienstraße'. Ah-ha I thought in my ignorance, that must be something to do with 'foxes' (Füchse), it being all rural and near the woods and everything. Nearly, but not quite. 'Fuchsien' is the German for 'fuchsias', the pretty red ballerina tutu-ed flowering shrub with the spindly purple 'legs'. 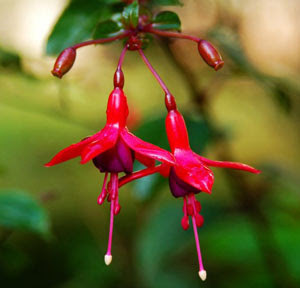 And fuchsias are named after the German botanist Leonhart Fuchs (1501–1566). The surname Fuchs is the same as the English Fox, so there is a linguistic connection. The German pronounciation determines that a 'fuchsia' should be spoken as called 'fook-sya', not 'fyew-sha' as I always have said it. This is not the same Dr Fuchs BTW as the British Antartic explorer Dr Vivian Fuchs, immortalised in the (probably apocryphal) newspaper headline 'Dr Fuchs Off To The Antartic Again'. Great name! Great breakfast dish of potatoes, onion, bacon (or veggie equivalent), and scrambled eggs all fried together on the stove. Throw in a bit of parsely and quartered tomatoes to make it almost healthy! During a very interesting tour of the Stasi Museum on Normannenstraße last Sunday, I became aware that just a few kilometres through the woods from our house there was once a high-security settlement of houses where the top-ranking members of the DDR SED Politburo hid out of harms way from the proles of Berlin. Apart from Erich Honecker (General Secretary of the Central Committee of the Socialist Unity Party of Germany and effective leader of the GDR/DDR 1971 – 1989), one of his neighbours was hunting buddy Erich Mielke, head of State Security and hence the Stasi. Nice. Thankfully those days are behind us now, and the compound where they lived (the Wandlitz Waldsiedlung or 'Forest Settlement') is now a place of care and healing called the Brandenburg Klinik. We cycled up there Monday, and you can see the houses where they used to live, now converted for caring for patients.